This is our weekly look at fantasy football adjustments you should make based on venue and/or weather. Entering the weekend action for the Wild Card Round of the NFL season, knowing which players should see an improvement or decline in their projection can be a key to victory. With southern cities of New Orleans, Los Angeles, and Kansas City owning three of the four byes, Wild Card weekend was the best chance to see some crazy weather these playoffs. But despite games in Baltimore and Chicago this weekend, there aren’t major weather concerns. That doesn’t mean you should ignore game context when you make your postseason fantasy picks. 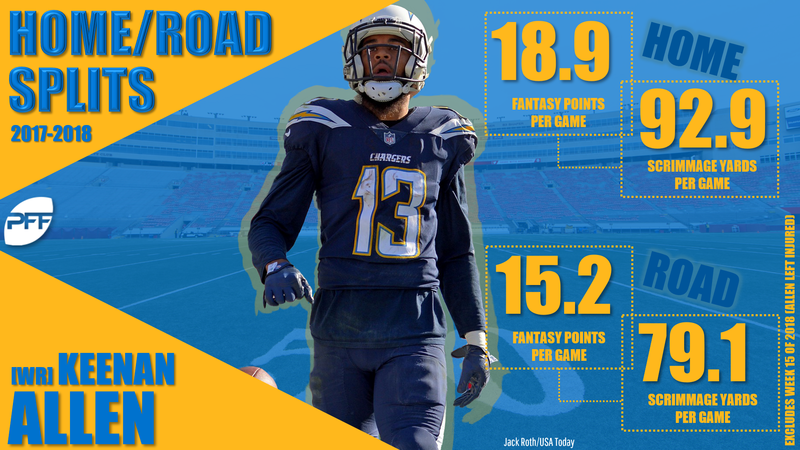 Home and road considerations themselves can swing the fantasy projections for players by more than a point. Based on my projected venue and weather adjustments, these are the players who should feel that impact the most. Both Saturday games will be played in retractable domes, and with forecasted temperatures north of 50 degrees Fahrenheit, both could play open with minimal discomfort. And even though the Sunday games won’t face extreme weather either, the domes matter for fantasy. My research shows that away teams that play in a dome don’t suffer the same production losses that typical road teams endure. Andrew Luck (-1.0) certainly seemed fine when he visited Houston in Week 14. He threw for 399 yards and two touchdowns that day, and Luck has actually had his two biggest yardage days all season in his two starts against the Texans. With the dome bump counterbalancing some of his and T.Y. Hilton’s (-0.9) projected road losses, you can start both with relative confidence. Deshaun Watson (+1.3) has had pretty balanced scoring at home and on the road in his career, but he’s still inexperienced with just 12 home starts and 11 road starts on his ledger. I’ll trust the overall positional trends that suggest he should perform better at home in the dome unless he maintains his current splits for another season or two. Interestingly, DeAndre Hopkins (+0.8) caught just 4 of his 10 targets in this matchup a month ago for a season-low 36 yards. Given that he went 10-169-1 in Indianapolis in Week 4, I consider that a fluke. Hopkins should be his usual dominant self against a Colts defense that is stronger against the run than the pass. For me, he’s more clearly the top fantasy receiver this weekend than any other player is the top option at his position. Dak Prescott’s (+1.3) home/road splits are almost as big as his with/without Amari Cooper (+0.6) splits, and both of those factors play to his advantage at home against the Seahawks this Saturday. The Seahawks aren’t bad defensively, but their tendencies there don’t figure to disrupt what the Cowboys want to do on offense. Ezekiel Elliott (+0.2) seems poised to take 25 touches, and that should drive fantasy success regardless of conditions. For me, the Seahawks side of this fantasy equation is much more fascinating. Even with the Ravens’ late charge, the Seahawks comfortably led the NFL in run ratio this season. 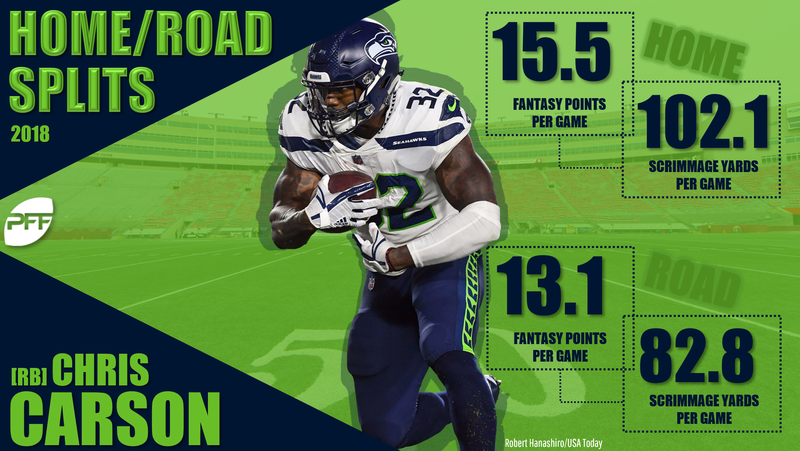 One might assume then they would follow Elliott’s lead and ride breakout fantasy back Chris Carson (-0.1), who is coming off of four straight games with at least 20 touches. But three of those four games came in Seattle, where Carson has seen much more work this season than he has on the road. Couple those tendencies with his matchup against a Cowboys defense that reduces rushing touchdowns per attempt by 30%, and I expect a little less Carson and a little more Mike Davis (+0.5) than their December workloads would suggest. For me, that makes Russell Wilson (-0.5) the compelling contrarian choice for fantasy this weekend. Only Prescott and Nick Foles are cheaper on DraftKings, and Wilson should benefit from the dome and the presumed Cowboys’ defensive strategy to play for the run. With a forecast of 42 degrees and moderate wind speeds, the Chargers and Ravens game is the milder of the two outdoor affairs Sunday. It’s tough to know if weather or anything else could stop Lamar Jackson (+1.0) and the Ravens rushing attack at this point. Their game against the Chargers in Los Angeles two weeks ago was their low mark in the Jackson era with “only” 159 rushing yards. For what it’s worth, the team has showed typical home/road rushing splits since Jackson took over in Week 11, and that should benefit him, Gus Edwards (+0.8), and Kenneth Dixon (+0.3) this weekend in Baltimore. Edwards projects for the bigger boost because his workload is all carries where Dixon sees a target or two most games and so has less extreme home/road splits. That said, I’m leaning toward Dixon as the better fantasy choice, especially since he’s a bit cheaper on DraftKings. Edwards and Dixon have exceptional yards-per-carry averages of 5.2 and 5.6, respectively, but both players owe some of that success to Jackson and the zone read scheme that increases their yards before contact. Based on their personal contributions, Dixon looks like the better back. He leads the team with 17 Yards Added on just 60 carries, and he’s the No. 1 back in football in elusive rating. Week 17 was the first time that Dixon had the same carry volume as Edwards, and I expect their workload tendencies to continue in those directions unless Dixon continues to fumble. Defensively, the Ravens cut passing and rushing yards per attempt by 10% a piece. That is bad news for Philip Rivers (-0.8) and Keenan Allen (-0.2), who produced just 181 and 58 yards, respectively, against the Ravens in Week 16. At the time, Allen was dealing with a hip injury from which he seems to have fully recovered. But even a healthy Allen has shown pretty marked home/road splits in recent seasons. It seems unrealistic to expect a vintage Allen fantasy performance with so many contextual factors stacked against him. Sunday’s forecast of 38 degrees and moderate winds in Chicago is a bit deceptive because wind speeds are set to start low in the morning and steadily increase to north of 10 mph come game time. Above 10 mph, wind starts to make a major impact on quarterbacks’ completion percentages and yards per attempt. Even before the home vs. road consideration, the dual-threat Mitchell Trubisky (+0.7) seemed better equipped to overcome that obstacle in fantasy than Nick Foles (-1.1). Because of the venue, weather, and their personnel, the Bears would likely have wanted to skew their game plan move heavily toward the run. But the Eagles defense is excellent against the run and on average cuts their opponents’ rushing attempts per game 20% and promotes their passing attempts per game by 10 percent. Unless this game follows the lead of the 1985 Bears’ playoff games, the Bears will likely be forced to mix in the occasional pass attempt. All things considered, that gives Allen Robinson (+0.1) a pretty neutral matchup. The Eagles’ excellence against the run changes their opponents’ strategies. The Bears defense doesn’t do that because it is excellent across the board. It reduces passing yards per attempt by 10 percent, passing touchdowns per attempt by 20 percent, and rushing touchdowns per attempt by 35 percent. That doesn’t leave a lot to love on the Eagles offense from a fantasy perspective, especially since each of Josh Adams (-0.3), Alshon Jeffery (-0.8), and Zach Ertz (-1.2) is hurt by the venue and weather conditions. 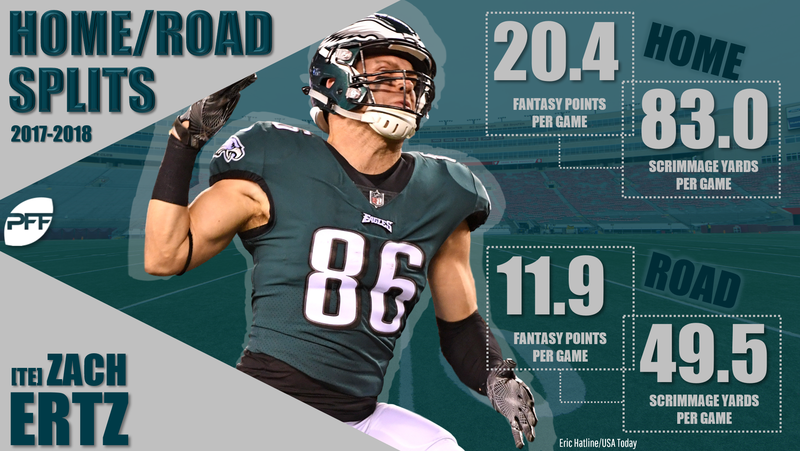 Ertz in particular has shown massive home/road splits the last two seasons, catching 2.7 more passes and scoring more than twice as many touchdowns per game in Philadelphia as elsewhere. Barring precipitation, this is about as bad a matchup as Ertz can get. That still doesn’t take him out of the top spot in my tight end rankings this weekend with no Travis Kelce or George Kittle to select in his stead. But his advantage over the second tier of Eric Ebron and Trey Burton could be much less than their relative points per game and DFS salaries would indicate.